A traditional Japanese inn featuring both an unagi specialty restaurant and highly praised ryokan cuisine. 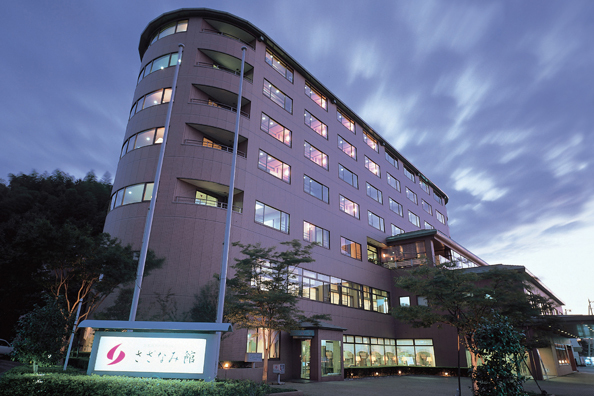 Sazanami-Kan at the Hamanako Grand Hotel is a traditional Japanese inn featuring a hot spring--the Kanzanji onsen, the pride of the city of Hamamatsu. 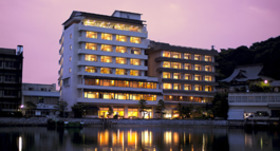 The Kanzanji onsen lies in the western part of Hamamatsu, on the eastern banks of Lake Hamana, and the lake's beautiful scenery is visible from every room and bath in the lakeshore hotel. Hamamatsu zoo and Flower Park, as well as the boarding point for Hamamatsu's pleasure cruises, are mere minutes away from the hotel on foot, making it a prime location for leisure and sightseeing. It also features an unagi specialty restaurant as well as the proud and meticulous cuisine of a traditional Japanese inn. 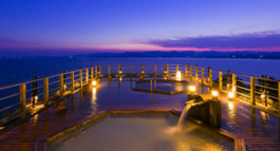 The large and spacious public baths on the third floor feature both indoor and outdoor open-air baths with views of Lake Hamana, where guests can take in sights such as fireworks and sunsets over the lake. The massage machines installed in the bathhouses are all free to enjoy. ※Also available for day-trip visitors. Guests can enjoy a full complement of proud traditional ryokan cuisine, using the bounty of the sea, mountains, and lakes, raised in Hamamatsu's warm climate. 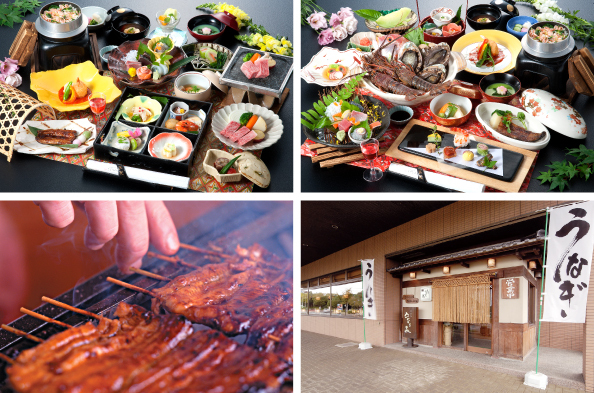 At Unagiya, the inn's unagi specialty restaurant, visitors can sample Lake Hamana's famous eel dishes. ※Unagiya is open to the public as well as guests of the inn. The inn's calm and composed Japanese-style guest rooms are constructed at a spacious 20 m2, while its round Western-style corner rooms feature wide windows offering a 180-degree panorama view. All rooms are built to provide a wide, unbroken view of Lake Hamana. 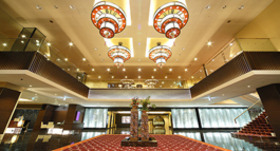 The inn also has special deluxe suites in both Western and Japanese styles. At LUXIS, the inn's relaxation salon, guests can receive not only basic treatments but also the salon's popular Ayurvedic treatments. The gift shop offers a wealth of local products from Shizuoka, Hamamatsu, and Lake Hamana. Rentals of multicolored kimonos are a particularly popular service among the inn's female guests. The inn boasts impressive facilities for after-dinner entertainment, such as its club lounge JOY, where guests can enjoy karaoke and drinking, and its exclusive Diva karaoke room (seating capacity up to 20). Limited to guests staying at Kanzanji-onsen affiliated hotels and inns, the itinerary of this free-and-easy bus tour conducted by local guides is changed every 2 weeks or so.Wouldn't you like to go on a 3-hour mini-tour around the various tourist attractions while being introduced to beautiful natural scenery for each season? Take the "Kanzanji Onsen" line bus (46 minutes ride) at bus stop #1 of the bus terminal to "Dobutsu-en (zoo)" then walk (1 minutes). Miscellaneous A cancellation fee will be applied within three days of your reservation.